I also really enjoy the efficacy of navigation provided by tiling window managers such as xmonad. 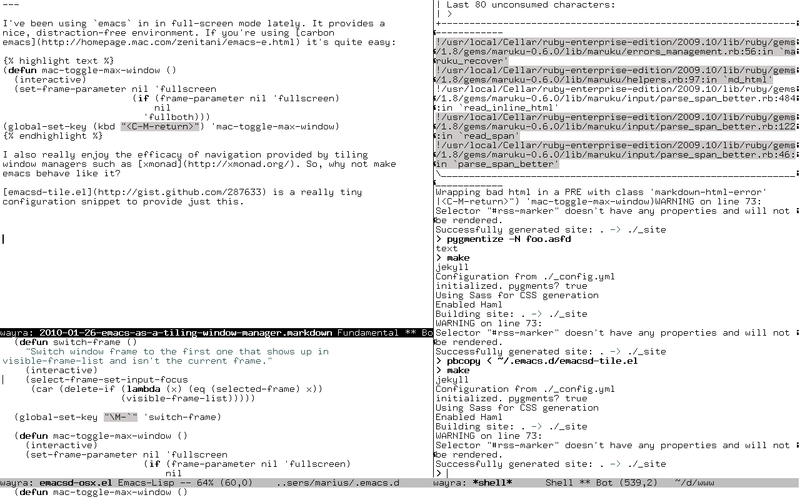 So, why not make emacs behave like it? emacsd-tile.el is a really tiny configuration snippet to provide just this. This mostly uses just stuff that was already in emacs! The only part I had to implement myself was window swapping. Another really handy feature of emacs is the ability to save window configuration in registers. With this, you can “stash” away an entire window configuration and recall it later. Any other improvements or suggestions?